Cook ground beef, chili powder and onion in 12- inch nonstick skillet over medium-high heat, stirring frequently, about 4 minutes. Stir in tomatoes and beans and cook, stirring occasionally, until beef is done and tomatoes are tender, about 4 minutes. Meanwhile, prepare Knorr Menu Flavors Pasta Sides - Chipotle Rosa according to package directions. Pour chili into 2- quart baking dish, then arrange hot pasta around inside edge. Bake 5 minutes or until bubbling. 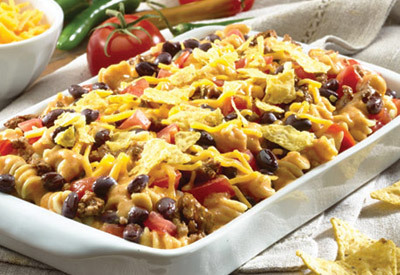 Top with you favorite chili toppings such as sour cream, cheddar cheese and tortilla chips.